On my way home last night, I stopped for gas. As I got back into my car and had my hand on the ignition key, something blew onto my windscreen. I thought at first that it was a bit of paper towel flying in the wind. The colour was the same, and it was a windy, rainy night. On closer inspection I realize it is a giant moth of some sort. I take several pictures, with and without flash. 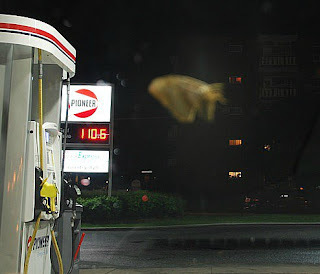 And somehow feel a need to share the moth with the woman pumping gas beside me. "Oh, really" says woman, who immediately turns back to watching the numbers on the gas pump, obviously not the least bit interested. 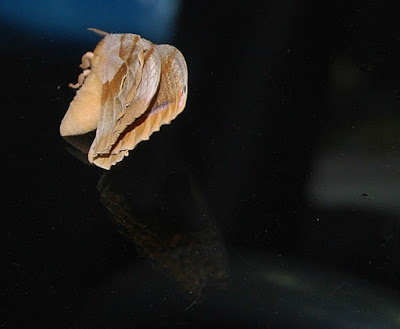 After trying to gently push the moth onwards, and feeling that he has his feet firmly suctioned to the windscreen, he suddenly flops over on his side, much like a cat will do when exhaustion takes over and a nap is needed. I thought he had keeled over and died. He could have been injured from the impact - a concussion, maybe. Though he was probably blinded and confused by the bright lights of the gas bay. Another gentle touch to see if he moves on his own and he straightens up again and spreads out his wings. Two teenaged boys walk over and they are quite interested in the moth. One also takes pictures, with the other respectfully asking "can I touch it?" I'd never seen anything quite like this before, and neither had they, which makes me feel slightly better about my ignorance. He has a fat furry body and lovely eyes. Though, as I look later at the uploaded pictures I wonder about his antennae. It seems there's only one and he must be able to fold it back out of sight. When I get home, I'm pleased that enough of my pictures were clear enough to be able to identify the creature from other images of 'moths in Ontario'. 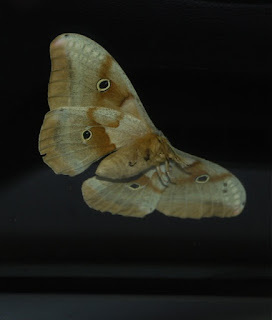 Turns out he is an Antheraea Polyphemus Moth. 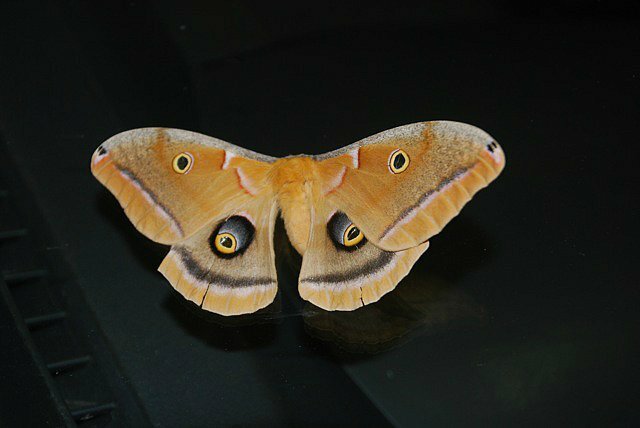 One of our largest and most beautiful silk moths. 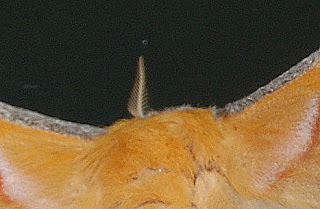 The adult has a wingspan of about 4-6 inches and its most notable feature are the purplish eyespots on the hind wings. It's from these eyes that it gets its name Polyphemus - the giant son of Poseidon and the Cyclops Thoosa of Greek mythology. And he is a she. The males are much less pretty. It's hard to fully see the giantness of this creature, so here is a picture I swiped off the internet with a quarter as a comparison. Sadly, I also learned that the Polyphemus Moth only lives for about four days. I hope her eventual death was peaceful. Or at least quick. Ooh, pretty moth. I have seen pictures of that one before, but never one "in person." Lucky you! I was quite thrilled he landed on my windscreen. I think she is beautiful. Mind boggling nature sometimes isn't it? All that loveliness for such a short life! I feel sorry for that lady who was so uninterested, what a sad person she must be. Love that the boys were ! Hope for the future. I know! I would have definitely been curious as to why someone was wandering around their car taking pictures of their windscreen. It did seem unusual - but it was also very bright at the gas station, and moths are attracted to light. It is quite lovely, isn't it. In my mind, I think of butterflies and being beautiful and moths as being rather plain. I now know better. the moth looks gorgeous. i love the different shades of colours. I think I actually gasped a little when she opened up her wings and I saw that eyespot! Now that is a curious mind. It always makes me chuckle that we travel with our cameras and of course take a photo of a moth on our windshield! Glad you got enough shots to be able to identify it. I would have been really mad at myself if I hadn't my camera with me. I might have had to phone my friend I'd been visiting and tell her to drive down the street with hers! 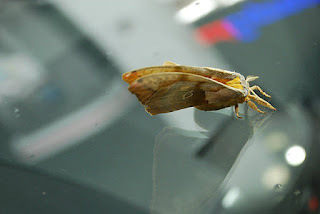 I think all moths have a very short lifespan, the lonest part of their lives is prior to emerging from a cocoon. yes, this was something I knew - but it looks so sad when you see it written out they only live 4 days! I am always interested in anything that is nature related. 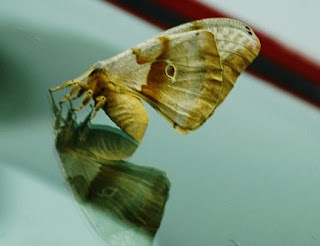 The moth is beautiful. I am so happy your photos are so wonderful for the id. Thank you for linking up and sharing your post. Have a happy weekend! and it's always exciting to see a bit of nature in the city! She is much more colourfully marked than I thought most moths would be. Shocking to hear they only live four days! What a lovely creature and so large!! I saw you on Saturday's Critters. thanks for visiting! and it is such a short time for something so big.